Have you ever read a book that starts out on a familiar path and then veers off it so completely that you're left slack-jawed in the dust? That's Shadow and Bone in a nutshell. Alina has been an ordinary orphan all her life. She doesn't have any great ambitions. Rather, she wants to quietly survive. The only constant has been her best friend Mal. They've been inseparable from the orphanage to the army. All this changes when a latent talent is discovered and Alina is whisked away by the Darkling, the mysterious magical leader to the Grisha training academy. Taken from all that she's known and most importantly Mal, Alina flounders among the Grisha. The weight of expectation is more than she can bear at first. All she has to turn to is her friend Genya and...the Darkling. I immediately liked Alina and only came to love her more as the book went on. She is quiet and focused. She can get so set on a goal that she unconsciously sabotages herself. She's a brave girl willing to take many risks to do what's right, but we also see her vulnerability. She spends much of this book being scared and lonely. I liked seeing the hard and soft side of Alina. Too many YA characters are either TSTL or so diamond-hard that they seem inhuman. Alina is a character to admire, but also prone to misjudgments, fear, and temper. Our two guys are Mal and the Darkling, but the book is not the love triangle I expected. Mal is a tracker, both in occupation and personality. Even more than Alina, he laser focuses on his goal. He is smart, cautious, and observant. Mal grew on me as the book went on. He's somewhat boring, but often dull is better than exciting for the really good guys. The Darkling on the other hand immediately set my heart pumping. Wow. I loved how he interacted with Alina at the very beginning. He is mature, decisive. He guides and protects Alina into her reaching her full potential. He gave off an aura of hardness with an undercurrent of kindness and reliability that made Alina's (and my) heart melt. Shadow and Bone is more epic fantasy than adventure story. As such, the pace is not speedy. The story takes a very long time to set up. It doesn't become shocking or really exciting until the last third. Even at that point, I was eagerly reading but not flipping the pages (except where the tension got too much and I had to look at the end). I wish I'd known to expect epic fantasy before I started the book. I was anticipating a faster paced story and was occasionally frustrated. The plot does move faster than most epic fantasy stories and if I'd been expecting that genre, I would have been very satisfied. 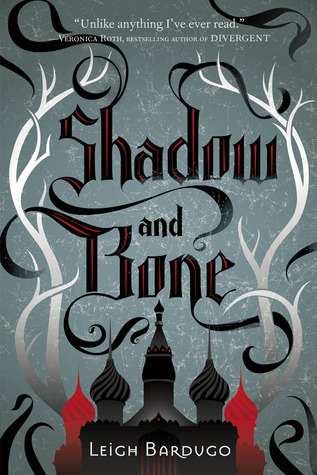 I really respect Leigh for taking Shadow and Bone in a direction I didn't expect. This book stands out because it doesn't try to repeat every other YA fantasy novel. I love it for that. However, I am a tiny bit disappointed that it doesn't follow the simple path that my mind expected. Like most readers, I make quick assumptions for what I think the book will be. I love being surprised, but I mourn a bit the loss of the story in my head. I highly recommend Shadow and Bone. It's a solid story with great characters. The Russian influenced language, culture, and setting makes the book even more fun. This is like nothing you've read before. I can't wait to get to the next one. Oh I am sooo glad that you loved this book so much! It totally took me by surprise by how much I loved it! and I agree, it's nothing I've read before! And about this assumption you talked... does it involve The Darkling??! I'm soo in love with this character but at the same time I'm so heartbroken!!! This really sounds amazing and I love reading about Russian history/culture. Fantastic review, Alison! I loved Shadow and Bone too! And even though I know it's "wrong", I still love Darkling. Oooh, the shivers. I can't wait for the next book! "slack-jawed in the dust" Yep. That's exactly how I felt reading this one. So not what I expected and yet it was everything I didn't know I wanted. Can't wait for the next one! I read nothing but fabulous review about this book. I'm hoping to read it next year or maybe closer to the release book 2. Great review! AHHHH!! !1 YES! I'm so glad you loved this book too Alison! I was instantly on board with the Darkling too, I loved how he was hard to pin down and I never really knew what he was feeling or thinking. I enjoyed Mal mostly because Alina had such strong feelings for him, but I couldn't help but be drawn to the Darkling:) Can't wait for Siege and Storm! I'm glad this book took a different twist. I'm a little tired of reading the same storyline but with new characters. I have heard such amazing things about this book. I'm hoping to read it over the Holidays so I can judge for myself. Like nothing you've read before? This sounds like a book I need to get ASAP! It seems like everywhere I go today this book is haunting me (in a good way) so I'm taking it as a sign I need to buy it. Great review! Great review! I'm wondering if you thought it would be more of an adventure story and less of a fantasy, since you expected it to be so different. I'll need to read this one as soon as I can. This was an awesome book!.!. Glad you liked it so much. I can not wait to see what happens next. I ordinarily hate love triangles but this actually really worked for me. Although I was initially neutral, the more I think about this book, the more I like it and the more excited I am for the next installment! I've been teetering on the edge of wanting to read Shadow and Bone or just letting it pass me by, but your review has moved it right over to my TBR pile. I really like what you said about "dull being better than exciting for really good guys." I'd never thought about it that way, but if he's too good, he might seem like a push over! Thanks for the insight! I've been wanting to pick this one up for a while now, and your review is only making me want to read it more. Agreed, this is such an amazing book. I read this over the summer and I was so engrossed in it, I read it like a cheetah! And I totally sympathize with losing the story that you made up as you read a really great book. I actually like how drawn out it is because it sets everything up perfectly and it gets so suspenseful and thrilling!